Google is trying out new interface for its search results page. Currently, randomly selected Google searchers will be shown the new search results page, which will has a left sidebar that contains indication of the number of search results for Google’s various services (Images, Groups, News, Local, Froogle etc.) as small green bars, which originally appears above the search box on search results page. The rest of pages (on the right) contains normal search results from Google. Below the left side-bar, there are also links for Advanced Search, Preferences, and Search History. 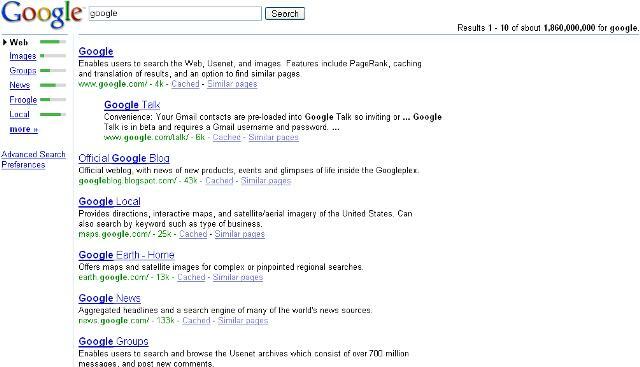 The hidden not yet revealed Google search results interface looks like above. But not all users are lucky enough to get to see the unpublished interface. However, there are a few way of hacks and cracks that will display the on trial Google page layout when you search. If you already in search results page, refresh the page, and you will get to see the allegedly new Google interface. Again, remove any line break so that it’s in a single line. If the browser show you some junk text, just back to Google and search. If you already in search results page, refresh. 1. Save Toogle Google Look link as Bookmark. To use this method, a cookies editor is needed. Add N Edit Cookies extension for Firefox is a good utility that allows you add and edit “session” and saved cookies. After install the extension, restart Firefox. Go to Tools > Cookie Editor. If it does not exist, or you have delete all Google cookies, then add new cookies. Click on Add. Enter PREF for the Name and string above for Content. Set the Domain to .google.com and / for the Path. Set the expiration date to any future date, choose “Expire at end of session” if you only want to see the not yet release Google interface until you close Firefox. The value should looks like below. Save the cookies once done. The method will make Google publish its “new” interface whenever you search until the cookies is expired. If you want to get back to the existing interface, just delete to cookie. via: downloadsquad (link dead) and motoricerca.